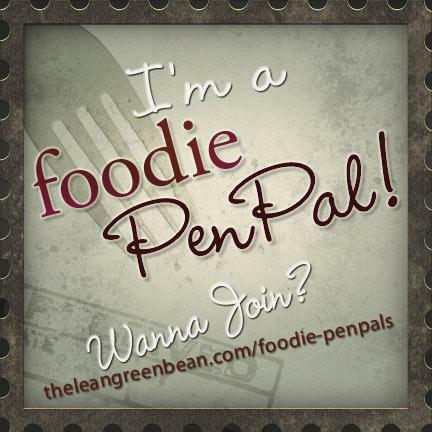 I am really enjoying be a part of the Foodie Pen Pal program! Every month I get to meet some great new people, share some goodies that I think will make someone happy, and receive some new treats! I was extremely lucky again this month being paired with two great women! This month I received a package from Jodie from Jo's Jam Jar. Jodie is a native of Australia who now resides in Ohio! She loves healthy foods and was kind enough to share with me some of her favorite snacks. Jodie also was great because she also replaced my original foodie pen pal who got sick, so she was able to put something together for me last minute which I was extremely grateful for. In addition, everything Jodie included was gluten-free so Joe was extremely happy with all the goodies she included! Food Should Taste Good Blue Corn Tortilla Chips/Crackers: These were a cross between tortilla chips and crackers. I loved the grains that you could see all throughout the chip. We snacked on these all the time. I also dipped them in salsa and tzaziki sauce, yum. Endangered Species Dark Chocolate with Raspberries: I love dark chocolate and the little bits of freeze-dried raspberry made for a decadent treat! I can usually eat a whole candy bar within seconds, but this is so rich that I eat one little square at a time! This is perfect for lovers of dark chocolate! Numi Chocolate Pu-erh Tea: This was my favorite thing I received in the package! It's a very smooth tea and you get just a hint of chocolate. Pu-erh tea isn't supposed to cause jitters, but it did with me... but it was also my first day of graduate school so that may not be fair. I still LOVE this tea! Loose tea: I don't have a tea ball so I haven't made this yet, but I just realized that I could probably make my own tea packet using a coffee filter! Edible Ohio Valley magazine: This was a great addition! I loved seeing all the different places you could eat or visit in Ohio as well as some of the fresh recipes included in the magazine. Athena is the lovely woman that I sent goodies to this month! She's the second gal from South Carolina that I've been paired up with since participating in Food Pen Pals. She seems extremely easy-going and open to trying new things, so I had a lot of fun putting together her package this month. She gave me a list of things that she likes and mentioned she likes to eat healthy but also has a sweet tooth, so I tried to incorporate that into her box. Athena is not a blogger, so I asked her to do a guest post for me! This is the very first guest post on my blog, and I'm so excited to have Athena do this for me! Please read below for Athena's wonderful and thoughtful post! Athena's box of goodies that I sent her! I was paired up to receive a foodie package from Renee for the month of August, and was I ever lucky! I mentioned to her that I prefer health treats with a sweet indulgence every once in a while, and she nailed it with what she sent. I received some AMAZING treats from, Renee! Some of the items I received I had never heard of or had heard of but never tried. She really “got me” with this package. It’s like she was inside my brain or something. The first thing I noticed when I opened the box was the card that had a beautiful photograph of the mountains on the front of it. I can’t wait to frame it. I love nut butters and to my surprise Renee sent me one of my favorite brands, Justin’s. I’ve never tried his chocolate hazelnut flavor before, and I must say it was very good paired with a banana! Another brand she sent was Artisana 100% Organic Raw Cacao Bliss. It’s chocolate coconut butter. I’ve wanted to try Artisana for a while, so I was super excited to see this one in the package as well. I wasn’t sure what to expect, since I’d never had coconut butter before, but let me tell you, it was fab.u.lous! I ate it on a banana (yes, I love nut butters and banana/fruit), and it was sinful. It was so good that I went on Artisana's website and sent them a comment about how much I loved it. They wrote me back and asked me to pick my top 4 choices of nut butters and they sent me samples of them. How awesome was that! Thank you for introducing me to them, Renee. Renee was very thoughtful and included some Santa Fe Olé green chile in my package for one because it was a local product, and two because I mentioned to her that my partner used to live in New Mexico and it would be something we could share together. She’s very thoughtful. I made turkey burgers and used them in a sauce for the top. Yum! Yum! Another local ingredient she sent was Valley Garlic Co’s Garlic Oil. I had no experience with garlic oil before receiving this, but I have made up for that. Little did I know I would get my first ear infection a few days after receiving this, and it just happens to be an all natural cure for an ear infection. I used a couple of drops a few times a day with warm compresses and Ibuprofen and voila. I was healed in a few days. I know that isn’t a foodie use, but it was a great tip I couldn’t pass up. Since receiving it, I’ve also used it in some rice pilaf and in a marinade for pork chops. This stuff is the bomb! Other items that were included in my box were a World's Finest Chocolate almond bar (yum...love these) and one of the new Nestlé Girl Scout Cookie flavored bars...caramel & chocolate. How did you know that was my favorite GS Cookie flavor? That bar should be illegal because it’s that good. Renee also sent me a Maple Pecan Pro Bar. I had never heard of these before receiving this one. Where have these been all my life? What a perfect breakfast bar! In addition to the breakfast bar, I received a bag of Love Grown granola. I LOVE this granola. I had the pleasure of winning 4 bags of it last year and let me tell you, it is all that and then some! Not only did she send me one of my favorite granolas, but she sent my favorite flavor (Sweet Cranberry Pecan). I’m convinced she’s a mind reader...LOL! I almost forgot about the package of chicken noodle soup mix she sent. I can't wait until the weather cools off so I can make it. It will be perfect on a cool autumn night. I still can’t believe how perfect my delicious box of treats was! Renee was amazing at picking things out that fit my tastes. Thank you so much, Renee! Thank you, again, Jodie and Athena for being wonderful Foodie Pen Pals. I am grateful that you were my foodie pen pals this month. I'm already looking forward to next month! My brother has an apple tree in front of his place that already has ripe apples, and for me apples mean that fall is near! Fall is my favorite season because of the cooler weather, colorful leaves, and the many activities going on around New Mexico. Summer being my least favorite season because of the heat and lack of summer break ever since I became an adult and started working full-time. So it was a delightful shock when he brought over a bag of apples to Sunday dinner and "humbly" asked for me to make him an apple pie (or two). This year, however, is also sad because New Mexicans are very attached to the Dixon's Apple Orchard who have some of the best apples on earth (and their apple cider is amazing!). Last year, Dixon's Apples were affected by the Los Conchas fire and subsequent flooding, which damaged much of the orchard. Many of us grew up eating the apples and traveling up to Dixon on opening weekend to buy apples. My favorite is their champagne apples and always find some way to get my hands on some and then go crazy looking for new recipes to try out. Last year, Joe and I drove up to Cochiti where they were selling the apples because it possibly was one of the last times we could buy some. It was bittersweet rummaging through huge bins of barrels looking for the biggest and most delicious looking apples while dusting off the ash from the fire knowing very well this could be the last time they'd be available. I won't have Dixon's Apples this year to eat or bake with, but I already have plenty of apple recipes in my queue to make as my favorite season approaches. This is my go-to apple pie recipe that I've been using for years. I just love how all the sauce oozes out when you cut through it-- though it doesn't make for good pictures or at least when I take them! If you think it might be too sweet for your tastes, add a little lemon juice to cut the sweetness a little bit. Depending on my mood, I'll either add it or leave it. This time I left it out. :-) Also, try it with my easy homemade pie crust and it will be even more decadent! Roll out one of the pie crusts and line a 9-inch pie pan. Set in fridge to keep cool while preparing the filling. Place apple slices in a large bowl. Mix in granulated sugar, brown sugar, and cinnamon. Add in flour and mix until well-coated. (Use enough flour so that all apples are coated.) Add in lemon juice, if you're using and continue to mix until incorporated (you may need to add more flour if you're using the lemon juice). Place in the crust-lined pie plate. Scatter the pieces of butter on top of the pie filling. Roll out the second pie crust and lay on top of the filling. Roll the excess pie crust over the edges and crimp to seal. With a knife, cut slits on top of the pie so that the steam can escape. Sprinkle cinnamon and sugar on top of the pie. Cover pie edges with foil and bake for 25 minutes, then remove foil and bake pie for an additional 25 minutes or until the crust is a golden brown. There are times when everyone finds themselves tired or with less time to make a meal. I'm a really slow cook, so it seems like everything takes double the time it's supposed to. Marinades seem to be a great solution for quick cooking, especially when the marinade only takes minutes to prepare and only 15-minutes to marinate! I found this recipe of G. Garvin's "Make it Pure Simple" awhile back and made this the other night. While the chicken was marinating, I was able to chop up veggies and start preparing them for our side dish. I'm also not very good at "cleaning as you go," but I found that I was totally able to do that with this dish. So it didn't take me hours in the kitchen preparing and cleaning like it usually does. This marinade is packed with flavor! Mustard, Worcestershire sauce, lemon and lime juice, and dried rosemary all blend together perfectly. I've mentioned before that I'm not a huge mustard fan. I really don't care for the regular mustard in the yellow container (with exceptions! ), I have discovered though that I do like the stoneground or whole grain mustard. It's much more mild and a little sweet, which I prefer (go figure). So, now, when recipes call for Dijon or regular mustard, sometimes I'll substitute stoneground instead-- which I did in this recipe. Now with school starting, I'll have even less time and I'll probably be relying much more on recipes like this, including this one. From G. Garvin's "Make it Pure Simple"
In a small bowl, combine Dijon mustard, lemon juice, lime juice, Worcestershire sauce, rosemary, and pepper; set aside. Season chicken with salt. Spread mixtures on both sides of each chicken breast half. Place in a bowl; cover. Marinate in the refrigerator for at least 15 minutes or up to 3 hours. I recently learned about this wonderful program called Love with Food. 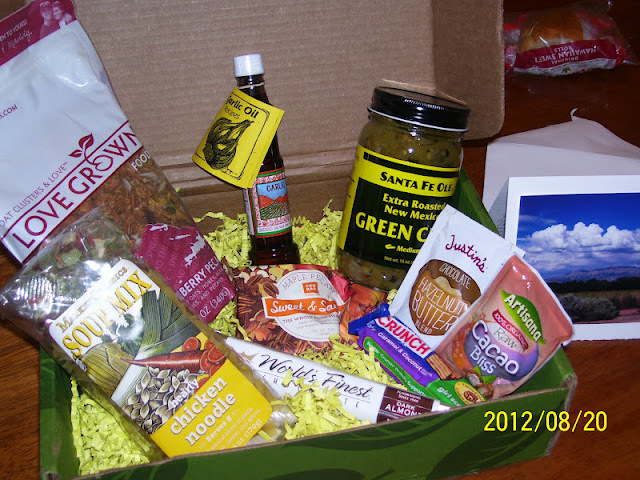 Love with Food is a program where its members receive a box every month with about 8 deluxe samples of gourmet goodies. It's only $10/month and for each box that Love with Food sells, it donates a meal to a food bank. So not only do you get a box of wonderful treats, your money goes to help fight hunger here in America. When I heard about this program, I knew it was something that I would love to participate in. I received my first box for the month of August. The theme this month was Travelin' Treats, so I received a remixed (and upgraded) version of airplane snacks. I'm currently on jury duty and these treats have been helping me get through the long hours of waiting and waiting. Sconza Candies Coconut Toffee Peanuts. Toffee is one of my favorite things in the world, so I opened these right away! The coconut was a perfect complement to the toffee and the peanuts. Easily my favorite thing in the box-- I'm going to have to get some more of these! East Shore Skinny Dipping Pretzels and Key Lime with Ginger Mustard. The pretzels tasted like normal pretzels to me and I dipped them in the key lime ginger mustard. I'm not a huge fan of mustard (coming around through) or ginger, but I love key limes. It's a little sweet and a little tart. I think it would probably be a good mustard to use for mustard chicken. Sun Flour Baking Company Vegan Lemony Lemon and Peanut Butter Cookies. These cookies were good and flavorful. I preferred the peanut butter cookie over the lemon because it had more flavor. I didn't think the lemon one had as much lemony flavor. The Ginger People's Gin Gins Super Strength Ginger Caramel Candy. Like mentioned above, I'm not too crazy about ginger so I was really apprehensive about trying this one. Reading "super strength" and ginger together had me a little in fear, but it actually was pretty good and I think the caramel flavor helped it from being overly ginger-y. Tangerine Glee Gum. These are cute and remind me of Chiclets! While I enjoyed these, they did taste a little waxy to me. Cherry Bay Orchards Dried Montgomery Cherries. This is the only thing I haven't tried yet, but you can't really go wrong with dried fruit, right? I'm saving these for Monday when I have another day of jury day ahead of me. It will be a good morning snack! I'm already looking forward to my package for next month. From what I hear, it's going to be pre and post-workout snacks. If you'd like to participate in this fun and cause-worthy program, please head over to Love with Food for more information. Note: I did not receive any money from this article. I'm a paying member who loves the idea of this program that in turn helps communities! There are only a few cookie recipes that I consider my favorite, and these are one of them. My top three cookies that I make are biscochitos, chocolate crinkle cookies (blog/recipe will come at some point), and these. Everyone has a favorite chocolate chip cookie and, while these aren't a traditional chocolate chip cookie, this is my favorite chocolate chip cookie recipe! Everything in this cookie works. The hazelnut and the toffee complement the chocolate well. (They seriously need to make Nutella with toffee bits.) This cookie isn't a chewy cookie, but it's not really a crunchy/crispy cookie either which I love. I originally got this recipe from Giada de Laurentiis from her cookbook Giada's Family Dinners, which is one of my favorite cookbooks. I made some slight changes to the recipe-- instead of making an oat flour, I kept the oats whole and increased the amount to a cup (this gives the cookies a great texture and they don't come out as flat). Also, I changed the toffee amount to 1 cup because toffee is one of my favorite things in the world. Sift together oats, flour, baking soda, baking powder, and salt. In a large bowl, use an electric mixer to cream together the butter, brown sugar, and regular sugar until light in color and fluffy. Beat in eggs and vanilla. Gradually add flour until it is well-incorporated but careful not to overmix. Stir in toffee bits, hazelnuts, and chocolate chips.